Social entrepreneurship is almost always too late. As practitioners of social enterprise, we hold the assumption that our responsibility is to exclusively act post-crisis in order to gradually chip away at a persistent problem, or to maintain a state of peace. The art of reaction is necessary, but the expectation of post-traumatic innovation as the singular starting point for an entire industry is limiting. What if social enterprise was also responsible for preemption? What if social entrepreneurs were also futurists? This is the message of our manifesto. Pay-What-You-Want to download the book immediately in digital format. You can also download and donate $25, and we'll send you a physical copy as a thank you! Also available on Kindle for $4.99. THIS NEW BOOK ON THE FUTURE OF BUSINESS AND SOCIAL IMPACT IS NOW AVAILABLE IN PRINT & DIGITAL FORMATS. Pay-What-You-Want to download our PDF immediately. Donate $25 at check out, and receive your own limited edition copy of the book. Also available on Kindle. and you'll get the PDF immediately, and enter our mailing list for exciting updates. and you'll get a beautiful and limited signed + numbered printed edition (act fast!). and you'll get the book on your Kindle, formatted for ebook devices;read from anywhere. Collection of Essays and Scenarios on new methods for innovation and social enterprise. 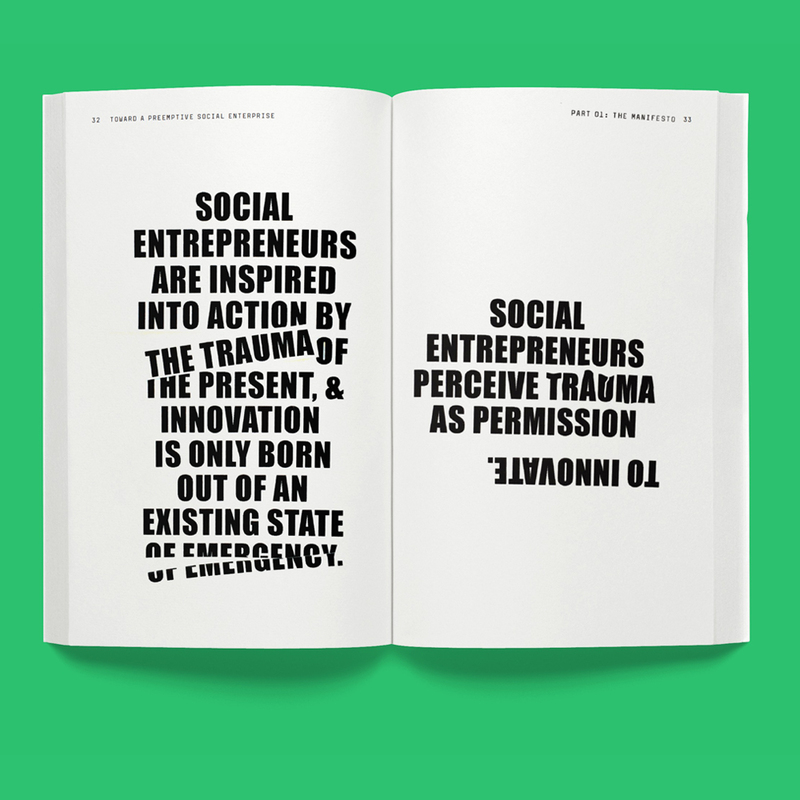 Manifesto to inspire the next generation of social entrepreneurs. Foreword by Stuart Candy, renowned futurist and thought leader. Interviews with Leading Futurists including Bruce Sterling. 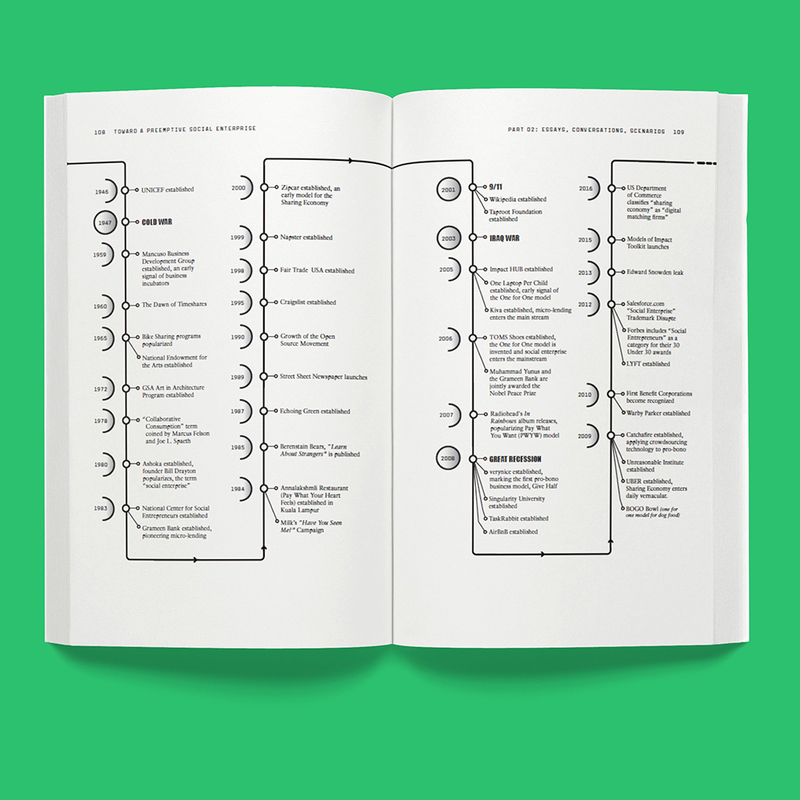 Visual timeline that maps the history of Social Enterprise. Hands-on workbook activities that challenge readers to invent their own preemptive enterprise. Now available in print and digital editions.